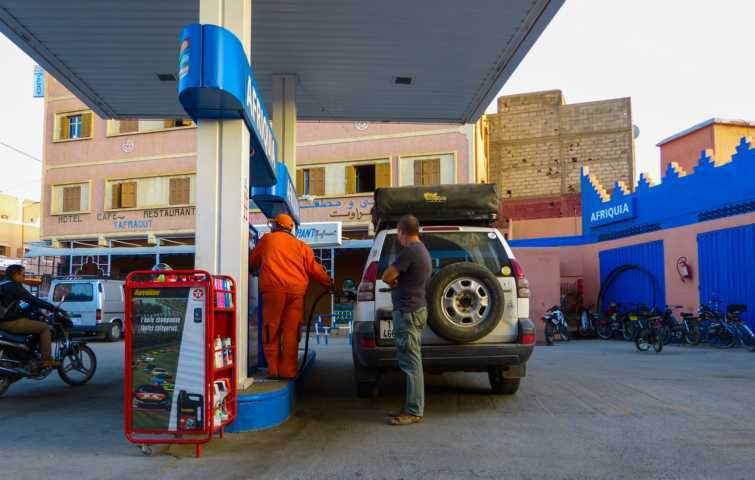 After having crossed all kind of Mauritanian’n’Moroccan flats the last week we needed some more hilly areas. So we decided 2 visit the Anti-Atlas with its numerous mountain chains, valleys and its hidden villages high up on the hills. 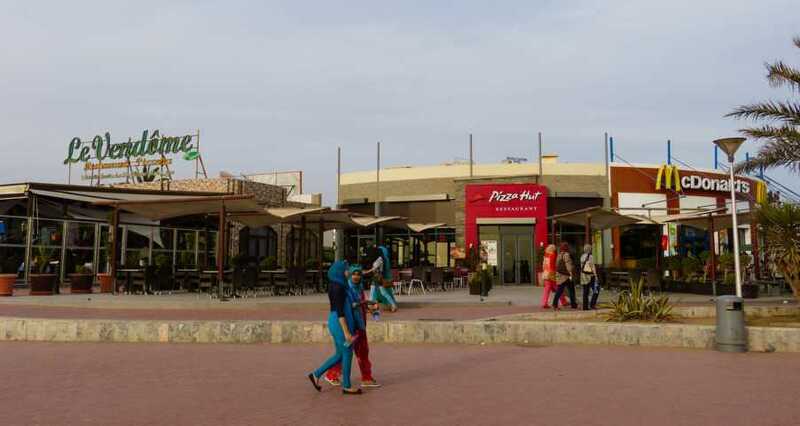 Well, 1st we had 2 say goodbye 2 Agadir with its huge hotels and its excellent selection of world famous food chains. 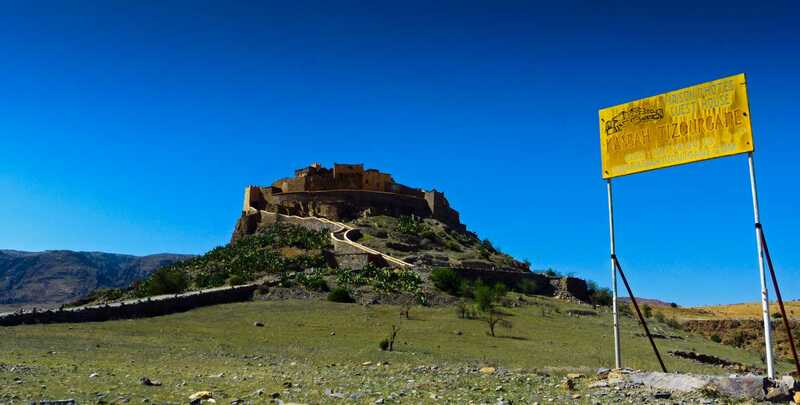 … visited on the way the famous Kasbah Tizourgane, a fortified village used by the population until mid of last century during unruly times. 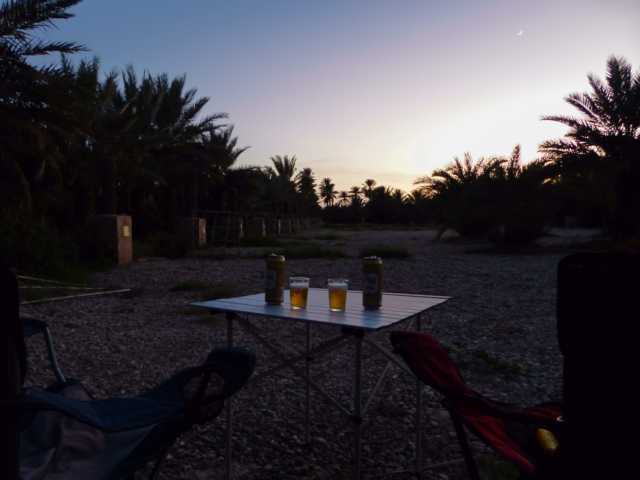 Late afternoon in Tafraoute. After having checked the hotel’s offers we decided 4 the campground. Camping Les 3 Palmiers was not a real highlight, but so conveniently located near the town we could not resist. 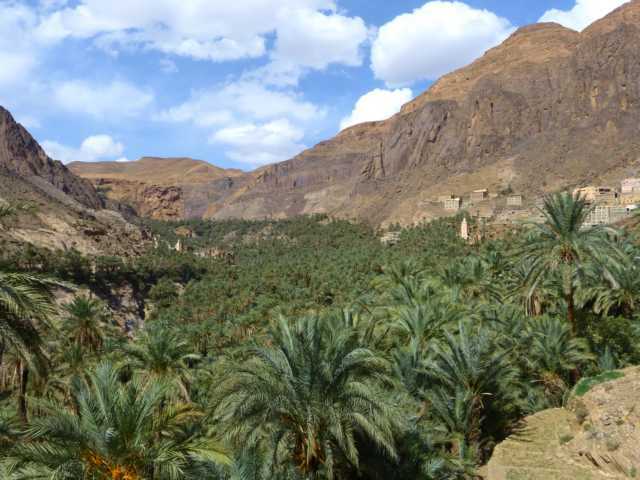 Next we headed 4 the Ammeln Valley, famous 4 its villages perched high up in the mountains and the narrow steep roads leading 2 them. Indeed the road 2 Tagdichte was pretty narrow, but the view awesome. Later we had to visit the famous painted rocks, an oeuvre of the artist Jean Vérame – according to unconfirmed rumours he tried to stimulate the local paint shops with this action. Whatever the reality, they look great in the desert. 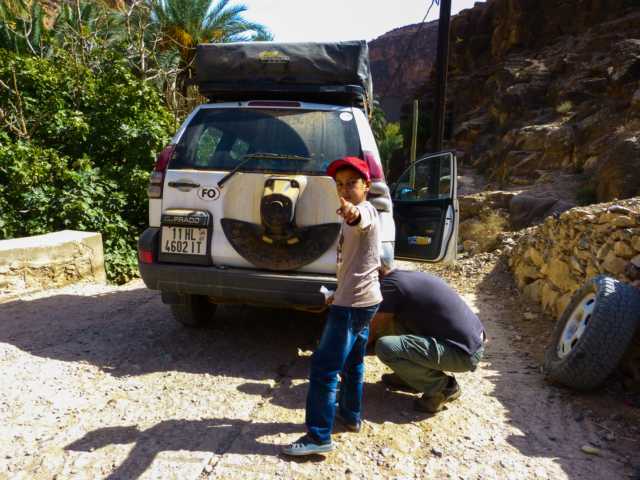 We visited the gorges of Timguelchte and Aït Masour just south of Tafraoute. … and Prado was happy again. 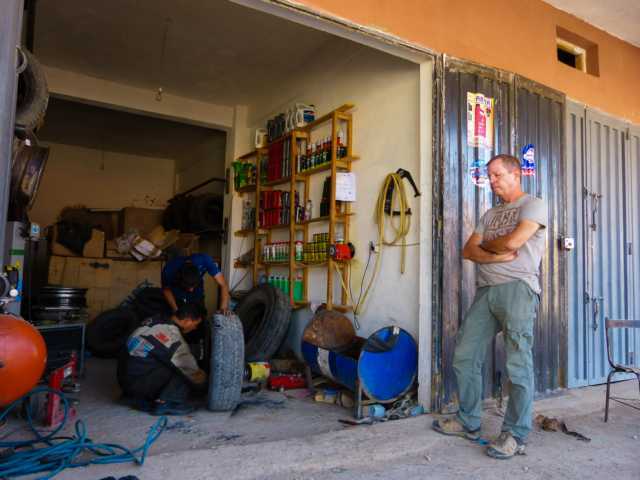 … and finally under the rigid supervision of a local expert we made some wheel changing exercises. 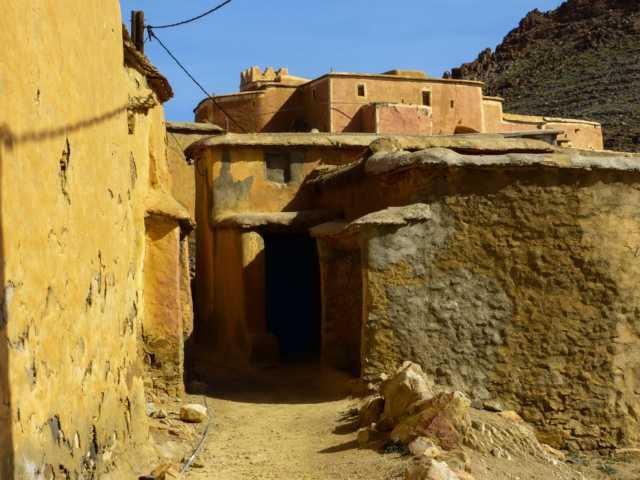 … in the evening we walked up to the fortified storage houses of Id Aïssa. 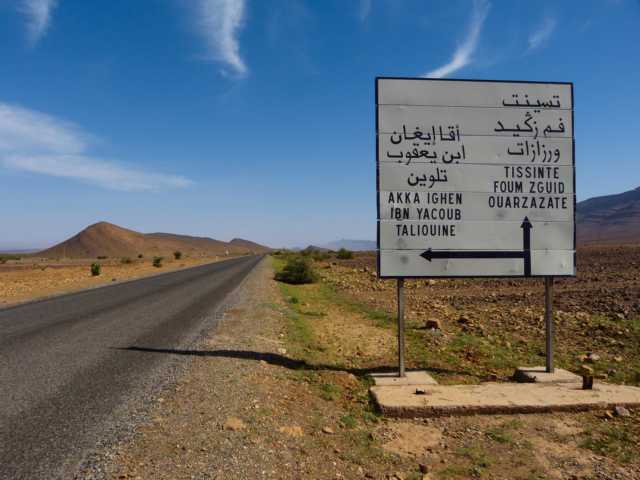 Further we moved thru the Anti-Atlas towards Tata. … and made a detour in Akka 2wards Igherm. 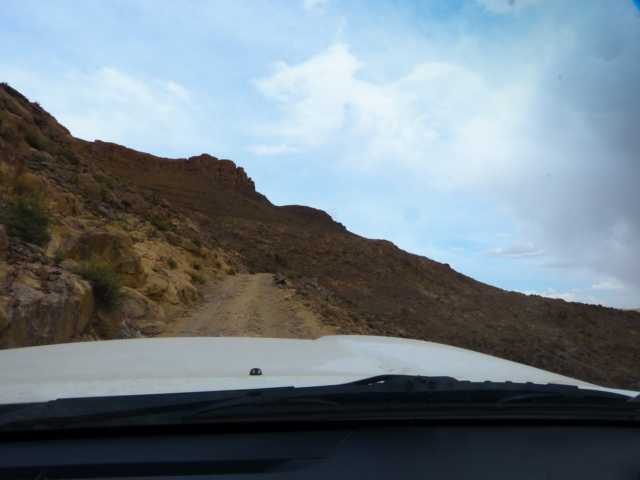 A round trip with some fantastic desert’n’mountain scenery. … and celebrated that decision with a nice ice cold beer. 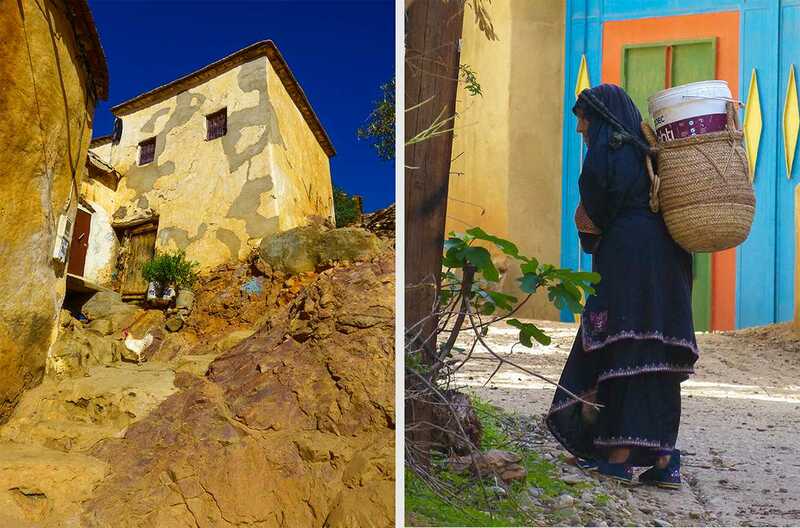 The owner of the guesthouse in Amtoudi highly recommended us to drive from Tata 2 Taliouine directly by the village of Agounion. 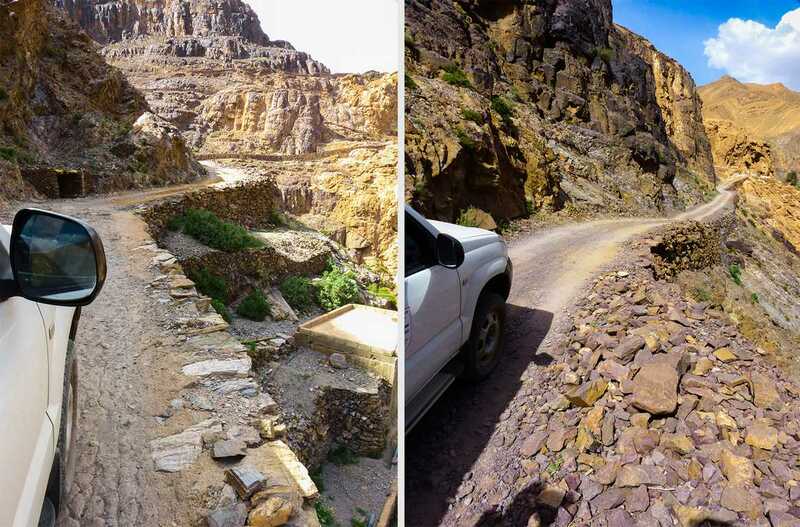 1 of the most spectacular trips in the Anti – Atlas, a petrified waterfall (if that exists) and the narrowest and steepest road in Morocco – we absolutely had 2 do this. And all this is, 2 our knowledge, mentioned in no travel book. … defintely not for a small car, neither for a campingcar. 4 a 4×4 in low range it may be ok.
After this ascent the remaining road was fine, not spectacular, but worth the trip. 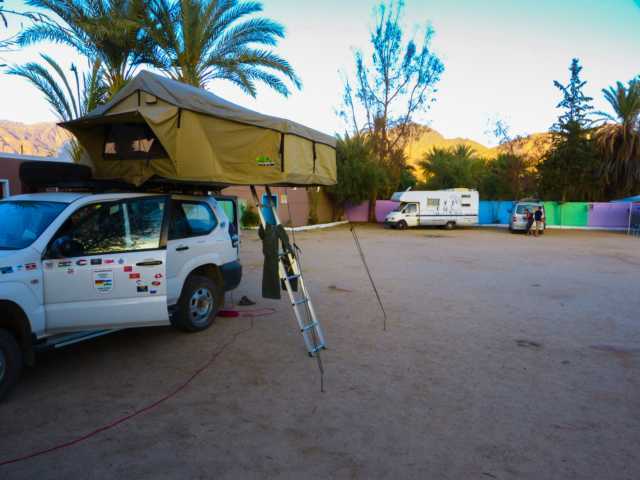 In the evening at the campsite Toubkal. Monika at her all prefered work – a task she normally generously delegates 2 Martin (comment Monika: liar!!!!). But as he got a kind of a cold she was exeptionally ready 2 replace him once. Well, after this nice experience Martin decided 2 get a real cold. Therefore, and as mommy said long time ago he needed a rest. 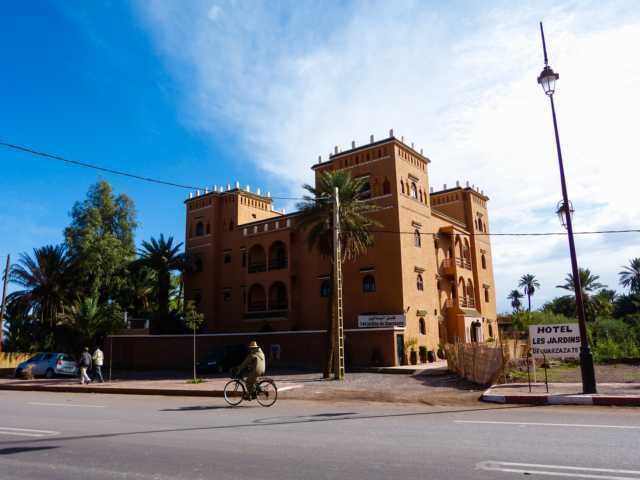 The place 4 this: a real kitsch Kasbah hotel in Ouarzazate. 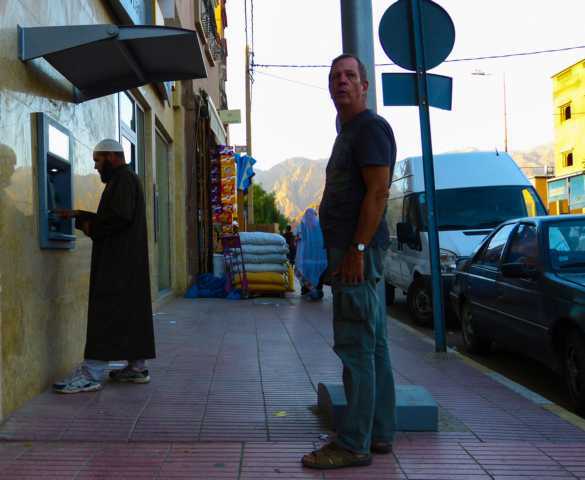 After 2 days we drove 2 Draa Valley – another Moroccon tourist hotspot. 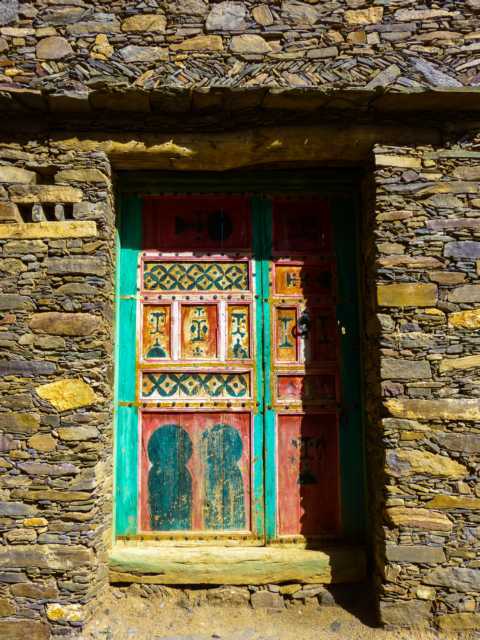 … and the next day the old Kasbahs in the valley, the famous villages all constructed out of mud and we were astonished on the degree of decay of all these famous houses. On we went. 2 N’Kob. 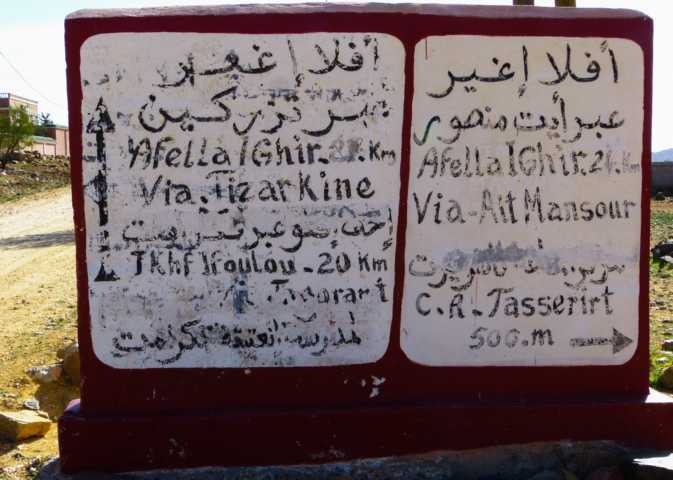 Here we had 2 drive 2 the famous Tizi Tazazert. 4×4 only, no small or 2 big cars. No problem if u have no hair. But if u have some – u have 2 maintain it carefully. There’s a profession called hairdresser. They promiss a lot, but who knows the result? In Europe they show the hell a lot of photoshoped pics of happy customers – all lies. In West Africa it’s easier: An artist just paints his girlfriend the way she should look like – and that attracts everybody. And few customers look like having survived a hurricane when they leave the hairdresser’s shop.